"ਹਿੰਦ ਮਹਾਂਸਾਗਰ ਦਾ ਤਾਰਾ ਅਤੇ ਕੂੰਜੀ"
↑ Ministry of Finance & Economic Development. "2011 POPULATION CENSUS - MAIN RESULTS" (PDF). Government of Mauritius. Retrieved 30 August 2012. 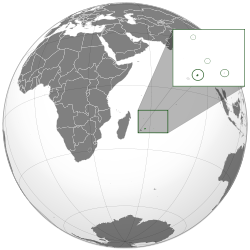 ↑ 3.0 3.1 3.2 3.3 "Mauritius". International Monetary Fund. Retrieved 19 April 2012. ↑ "Human Development Report 2011 - Human development statistical annex" (PDF). HDRO (Human Development Report Office) United Nations Development Programme. pp. 127–130. Retrieved 16 April 2012. ↑ "Tourism − Overview of Mauritius". Government of mauritius. Retrieved 4 January 2012.